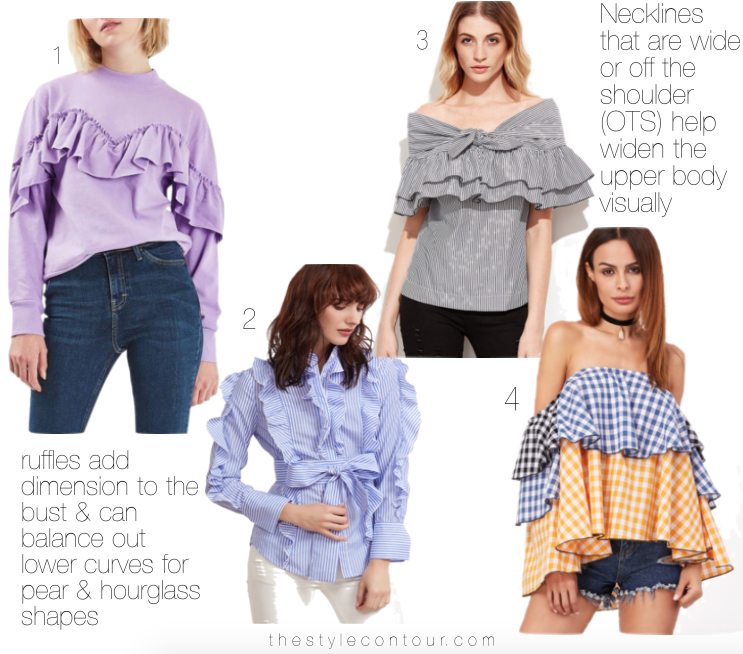 If you wish to enhance or add some dimension (aka make your bust appear fuller) opt for ultra voluminous ruffle tops specifically around the bust area. If you're bottom curvy and want to visually maintain those curves with the tops you choose, I'd suggest an OTS or bordot style (like #3) that will help to (visually) widen the chest, which will maintain your lower curves. Some styles can make the hips appear wider or smaller by the way they're designed. A common insecurity many of us women have are our arms. Many wish to avoid attention being placed on the arms and though I can and do suggest that you love and embrace your body for what it is because you're beautiful, which is very much true, at the same time, I know I'd also get a blank stare, like girl, are you serious?! Easier said than done and I get it. So, I suggest you pay close attention to the placement of the ruffles, as well as overall detail. 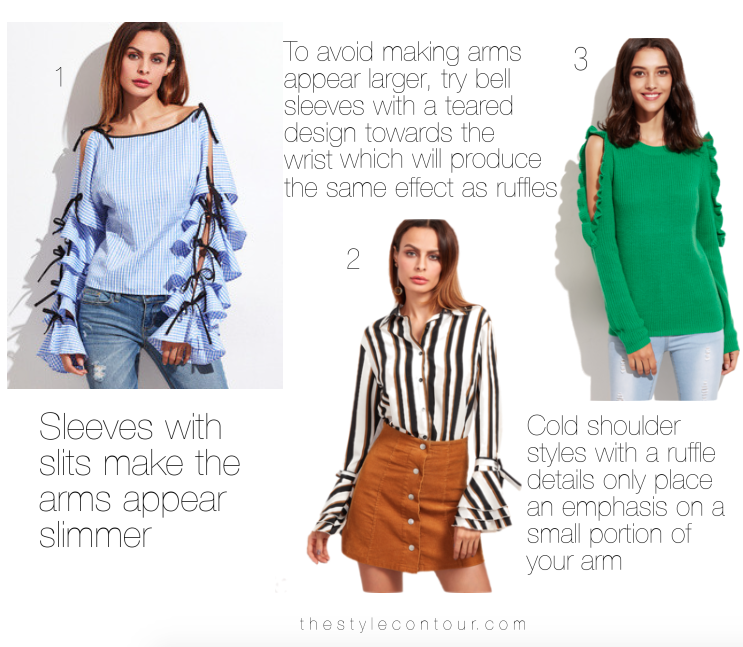 Right now, teared ruffle sleeves are what's happening and this doesn't exclude you from being able to pull them off because you feel they make your arms appear larger. Opt for styles like the one shown above (#1) that combine a effect that can counteract the fullness and make your arms appear slimmer. In addition to the tips mentioned in the set above, when in doubt go black or navy. The dark colors will slim the entire upper body, allowing for you to freely play and experiment with the texture on the arms without feeling self-conscious. I hope you found my tips helpful, my dear friends, and decide to experiment with the trend this spring and summer. As mentioned, there are so many different styles to choose from that you're sure to find something that works for you and your features in a way that will make you feel and look good. Not only are ruffles a great way to add a feminine element to your look, it's also a great texture mix to add to a monochrome outfit to add depth and dimension to your overall look, the possibilities of styling are endless! 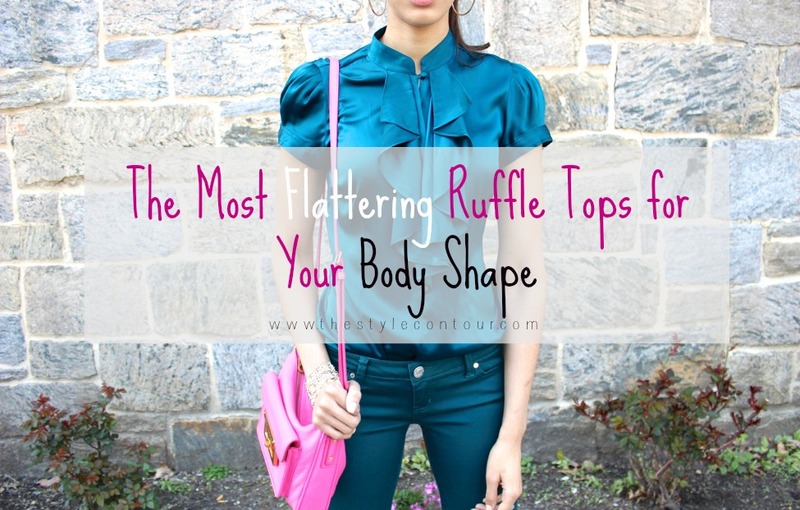 Are YOU loving the ruffle trend? If so, what's your favorite style (one shoulder, OTS, cold shoulder, etc)?! Thanks so much for stopping by and I hope your day is as fabulous as YOU!